Prospecting around and enjoying the New 49’er properties near Happy Camp in northern California! 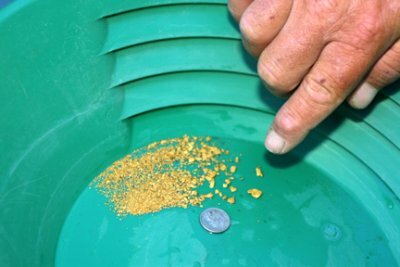 Last winter my partner and I devoted our two-week-long vacation to gold prospecting. We enjoyed our time exploring some New 49’ers Mining Club claims, in the beautiful Mountains of Siskiyou County in northern California. We panned for gold, dug out crevices in rocks that “old-timers” missed, hunted for nuggets with metal detectors (“nugget-shooting,”) and surface-sluiced some virgin placer material! 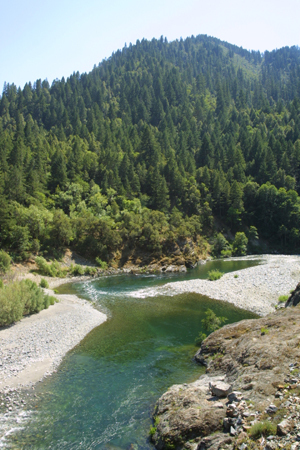 The New 49’ers Mining Club has around 60 linear miles of mining claims on the famous gold-rich Klamath River and its tributaries, including the Scott River, Salmon River, Elk Creek, Indian Creek, and others. Our objective on this trip was to locate promising stretches of river to gold dredge this next summer. We also “scouted” easy access points and comfortable, enjoyable campsites. The rivers and creeks were running fast and high, making it easy to identify the low pressure areas, like back eddies, that allow placer gold deposits to form. We quickly found more highly promising stretches of river to mine than we could ever hope to dredge in a hundred lifetimes! The first couple of days we did some surface-sluicing behind a huge boulder on the west bank of the world famous Scott River. We found a few small nuggets (“pickers”) in our first small sample hole. We averaged about 10 to 15 gold flakes in each pan. That was pretty good, since we’d only mined a couple of yards of material and weren’t on bedrock! But, we wanted more gold! Moving upriver, we located a large bedrock outcropping with a two-foot ledge that extended into the bank at least six feet. This bedrock was smooth; it was old river channel! A very good place for placer gold to deposit! So we set up our sluice there, and started following this bedrock across the surface of the streambed. My partner soon found a nice nugget in the header-box of our sluice. I cannot tell you how excited we got, because we hadn’t even dug three feet! Some nice little nuggets (“pickers”) were visible in front of the first riffle. Panning the material from the sluice box averaged around ten thick golden flakes to the pan. This gold was a little more coarse (i.e. 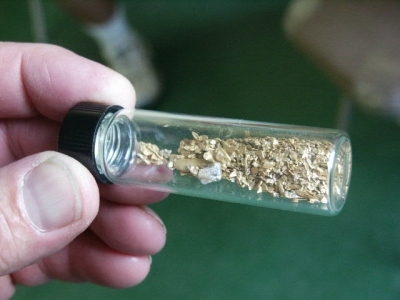 “chunky,”) than the gold from the first sample hole. We worked on this ledge a couple more days, finding some really nice gold, before deciding to sample another area. Nuggets weighing many pounds have been found on the New 49’er claims along the Scott River and in the immediate surrounding locations. That’s the reason we wanted to use our metal detectors! However, even though we went to some old hydraulic mining tailings high above the Scott River, we were only able to find nails, foil, hot- rocks, an old shovel and a horseshoe; not quite the large nuggets that we know are “out-there” still waiting to be found! Don’t worry; we will be back! It rained again the next day. So we decided to set up our sluice on a tributary of the South Fork of Indian Creek. We knew several members of the New 49’ers Mining Club had previously done very well on this creek. After looking around a bit, we located their workplace a short distance from the road. Starting where they had left off, we soon encountered extremely hard-packed gravel. This made digging pretty slow and difficult. We used picks and six-foot steel bars to break up the gravel before running it through the sluice. We mined this site slightly more than a day, recovering a few nuggets and approximately five nice golden flakes to the pan while cleaning up. Cleaning up the sluice every hour told us if we were on the right track. After a while, we felt we should move to better ground. During the rest of the second day, we drove up the South Fork of Indian Creek, looking for access roads. We encountered snow towards the top of the mountains. About four inches fell the night before. Driving down steep access roads in the snow did not seem wise, so we didn’t have the opportunity to prospect the New 49’er Indian Creek claims as much as we had hoped. We plan to get back up there this summer and really take a look! Rain fell pretty steadily the next few days. We scouted out claims on the Klamath River, while crevicing and “nugget shooting,” One afternoon, in between rain showers, we stopped on K-21 just below the bridge over the Klamath River in Happy Camp. My partner pulled a clump of roots out of a crack in the bedrock. We couldn’t believe our eyes! It easily produced the richest pan of gold either of us have ever seen! I’ll bet that there were at least 50 gold “colors” in that one pan! I thought, after seeing that pan: How much more can we find with a dredge or motorized sluice? We definitely plan to mine this particular spot in the future! Only one more day to play! We decided to check out the New 49’er claims on Elk Creek. The main road into the area was passable, “one-lane” in some spots. But it wasn’t too bad, considering the extent of the previous year’s flooding. We found a lot of good access roads and excellent camping locations along Elk Creek. A deep pool, just downstream from a high-pressure area, looked very good! Elk Creek has a very rich gold mining history, and I am looking forward to spending some quality time dredging here this summer. 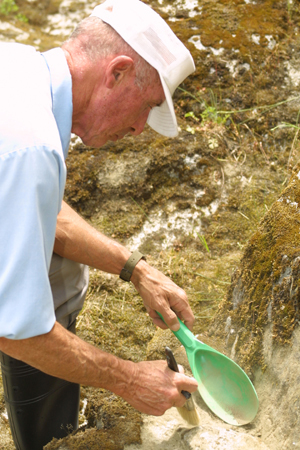 Winter is a good time to go prospecting; it is a sure cure for cabin fever. You have the whole country to yourself at this time of year, because there is hardly anyone around. We did not see a single person on the river or creeks that we visited. Water is high enough that it is possible to prospect (pan or surface sluice) locations that are normally dry. Mosquitoes and flies are very “low-profile” during the winter. We did not see any! Perhaps most important of all, the high water allows you to see where the gold is being deposited, since you can actually see the water in flood conditions. Go prepared! A good rain suit, hat, gloves, and rubber boots are essential, if you plan to work in the rain. I’ll bet that it rained 12 of the 14 winter-days we spent on the Klamath River in Northern California. When you have got “gold fever” as much as my partner and I do, a little rain won’t stop you from doing what you enjoy most in life; prospecting and finding gold!